In the immediate aftermath of United’s Champions League Final defeat to Barcelona my fourteen year old brother, wracked with disappointment like the rest of us asked; do you think Sir Alex will leave? There wasn’t a moment’s hesitation in my answer, of course not; in fact I would argue that there would have been more chance of Ferguson calling it a day if United had picked up their fourth European Cup. I don’t for a second think he would of but defeat drives winners like Ferguson on to bigger and better things. Sir Alex’s famous quote which has been bandied about in recent weeks due to the teams nineteenth title triumph refers to Ferguson’s great satisfaction in knocking Liverpool off their perch, however after watching Lionel Messi and Co. produce some of the most scintillating football ever seen on Saturday Ferguson may just have accepted his final great challenge of his Manchester United managerial career, beating Barcelona. I have been careful with my words here as of course this current Barcelona team will out stay Ferguson in football and with players of high quality only in their mid-twenties they could perceivably go on to become one of the most successful teams ever. What happens in the La Liga is of no concern to us though, where Barca cause us grief is in Europe and Ferguson now knows that the perfect swansong of his United career could be beating the invincible Catalans in the European Cup Final. I make it sound so easy though don’t I and as we know fairy tales don’t often come true, just look at last Saturday, how special would it have been to see Edwin van der Sar lifting the European Cup on his final performance in football, the hallmarks with Schmeichel’s final game were uncanny however football is football it doesn’t always work out. So, fairy tale aside whether or not my picture perfect finish happens with Ferguson beating Barcelona in the Champions League final at, let’s say Hamden Park in his final United game and riding off into the Barbados sunset with ol’ big ears and Lady Cathy in tow is irrelevant, I believe that before he leaves the Manchester United hot seat Ferguson will want to beat Barcelona on the way to another European triumph, whether it be in the knock-outs, quarters, semis of final he will want to leave the Catalan giants in his wake whilst the men in Red lift that famous trophy once again. To say this will be Fergusons biggest challenge would not be churlish, pundits after the game at Wembley said that it in essence it was just like Rome in 2009 when Barcelona put United to the sword in a 2-0 win. Well, I’d go as far to say that it was similar however this time I felt United gave a much better account of themselves, possibly one or two of Barca’s goals could have been dealt with more professionally however generally I didn’t think the Reds were all that bad, in fact I though at times their football was very good and the highlight of the night was without doubt Rooney’s brilliant finish, he started the move and finished it, it was brilliant however it was as good as it was going to get. Before the final I acknowledged that Barca were an amazing outfit however I honestly felt that there was one team who could beat them, us. The team had clearly prepared to the fantastically, there was no stone left unturned, Rome was watched again and then put to bed and all the players seemed confident in their own ability and their chances against the best club side in the world. To my shame however I am not a regular watcher of the Spanish league and had only really watched Barcelona play in the Champions League this season against teams that I feel United are superior too, in fairness though even if I did watch Spanish football every week my opinion prior to the final would not have changed given that save for Real Madrid the quality in La Liga is no match for Manchester United. For this reason I felt that United had a great chance, some stated that all United had was hope I felt we had much more. As it was Barcelona were utterly brilliant and would have beaten any other team in the world playing some of the football they did on Saturday, in fact at times it was so good rumour had it that Guillem Balague had to be given gas and air! Joking aside though this result should have no bearings on this United side, chastised throughout the whole season we are the Champions of England and I believe that had we played any other team at Wembley we would now be European Champions. Being beaten by the best may provide some consolation for the fans but the players will take no consolation and the manager certainly won’t, as the players climbed up to the Royal box each received their loser’s medals and each in turn took them off. These guys have been schooled under the biggest winner of them all they are all born winners, a lesser team would be happy with being second best behind the mercurial Catalonians however not for Manchester United, only the best is good enough however this will only inspire the team and the management. 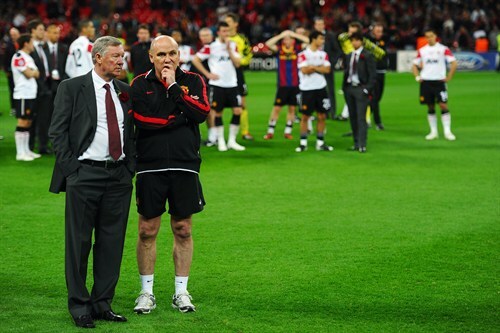 As Barcelona deservedly picked up their fourth European Cup a solemn and visibly gutted United watched on however in amongst them Sir Alex and his assistant Mike Phelan were locked in deep conversation, one would not be surprised if they had already turned their attentions to next season as the plot to win title number twenty and to break the vice like grip of the unconquerable Spanish begins, this is a challenge Ferguson will relish and will not for a second have thought of shirking it. It’s a given now that there will be changes at Old Trafford in the summer with high profile departures such as Edwin van der Sar and Gary Neville the club knows it needs to bring in a few fresh bodies in order for us to go again. I wait in unquenchable anticipation to see the impact that local lad Danny Welbeck and midfielder Tom Cleverly can have, many have said since Barca’s 3-1 win on Saturday that United should not panic buy but we should invest time and money into our own home grown talent and in turn taking a leaf out of the book of the team that so ruthlessly dispatched us in London. I really hope that the likes of Cleverly, Welbeck and Diouf can continue the tradition of so many star players that have gone before them but it would be ignorant to say United do not need to buy, of course they do and will. Who United should buy is of course entirely personal opinion but in the end only one opinion matters and I am sure Ferguson will bring in the most effective personnel available as he begins the start of his final, greatest challenge.